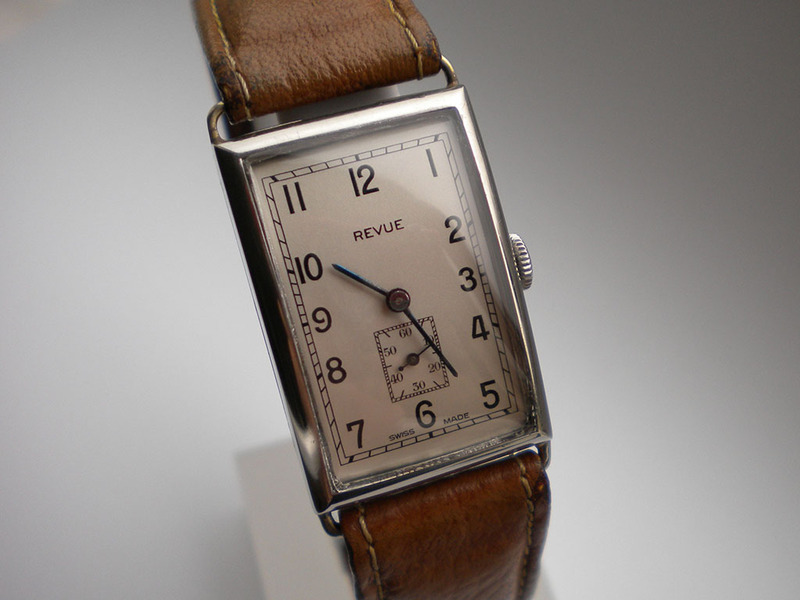 I refurbished this charming oblong cased Revue earlier in the year. As you can see it was looking a little tired with a marked dial and glass, and it didn’t run for more than a few seconds. 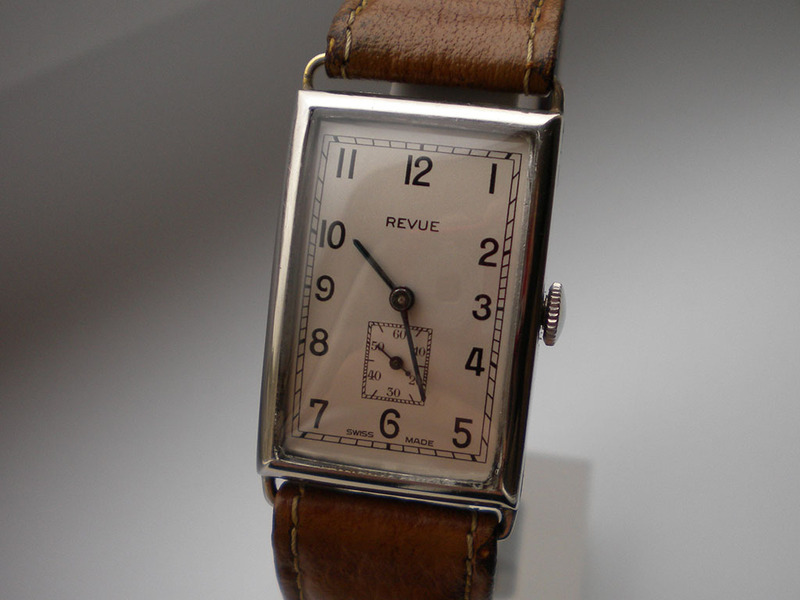 It was decided that the watch would benefit from a replacement crystal, a dial refinish, a complete movement service and a clean up of the case. 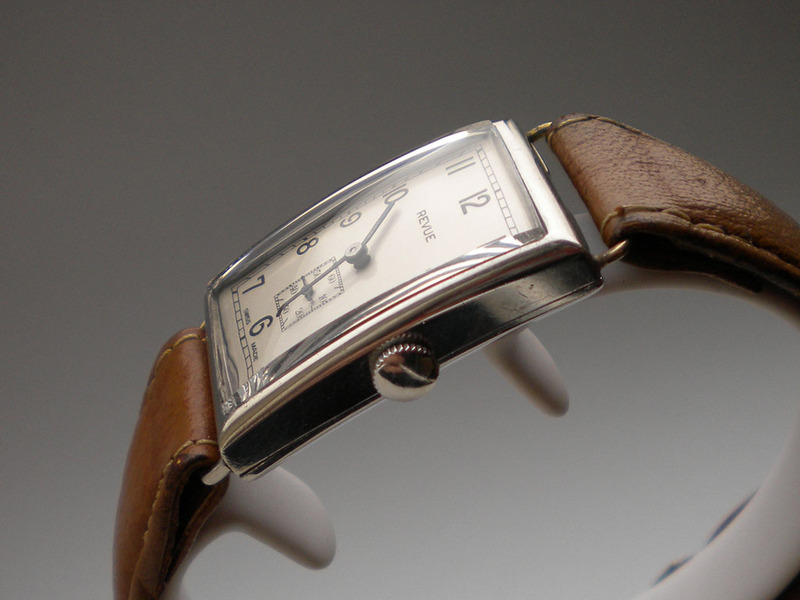 With the movement removed from the case you could see the amount of damage to the dial, and the bent seconds hand. 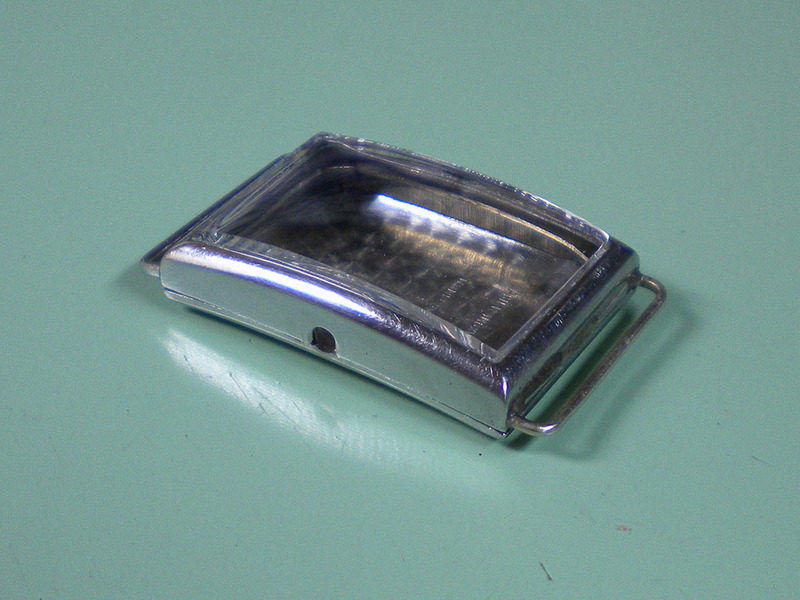 The case had also had the lugs crudely reattached at some point, you can see a large globule of solder that has been left on the side of the case. 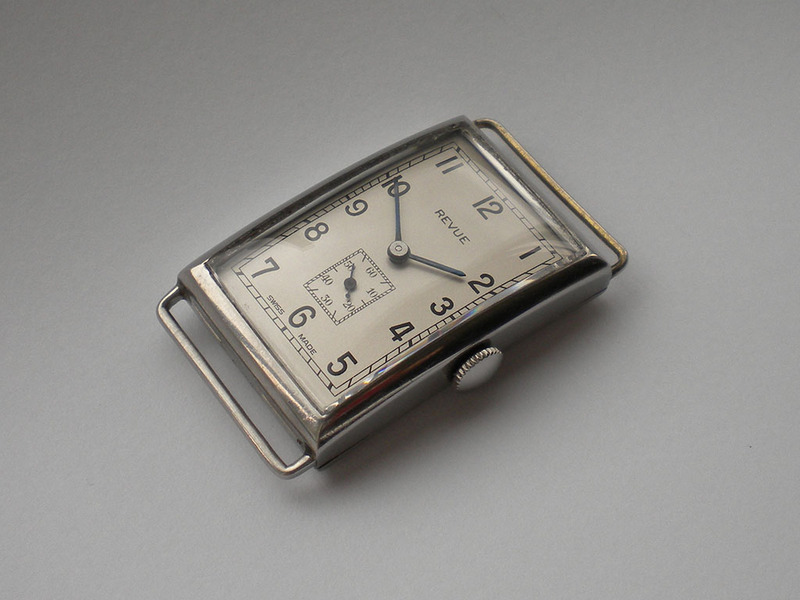 The movement was in reasonable condition for a vintage piece, an interesting modification to the click spring had been installed somewhere in the dim and distant past. 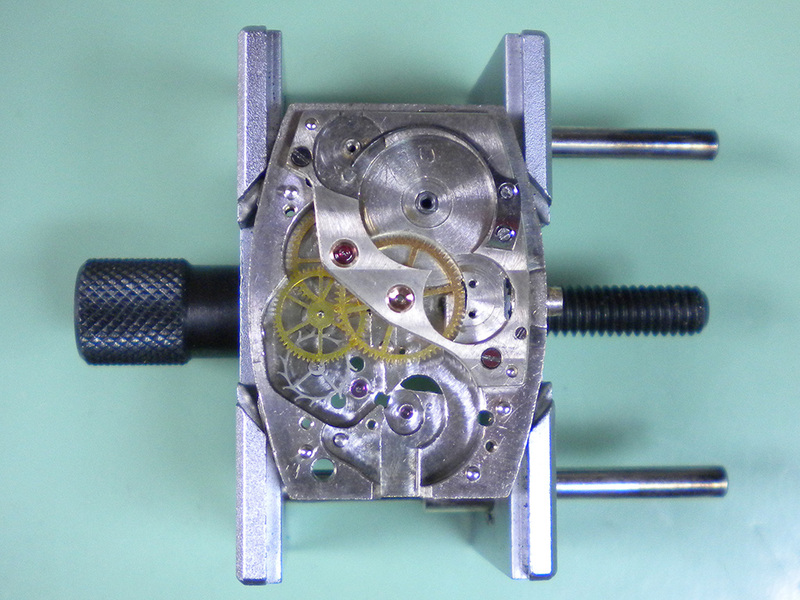 Instead of replacing the little spring that would normally sit under the click, a watchmaker has drilled, tapped and screwed a large arched spring to the top of the movement. A lot more work than just replacing the original, but it does work effectively and I found it to be quite an unusual approach! 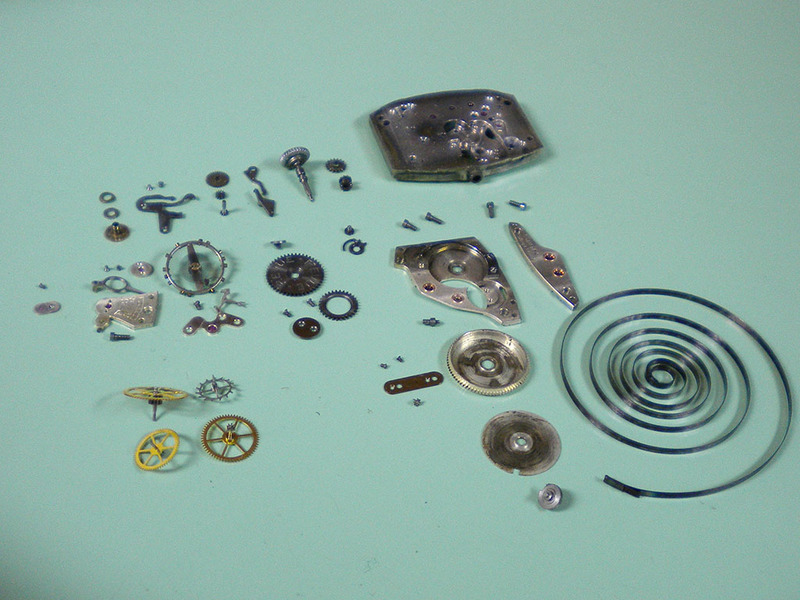 The movement was stripped and cleaned ready for inspection and reassembly. 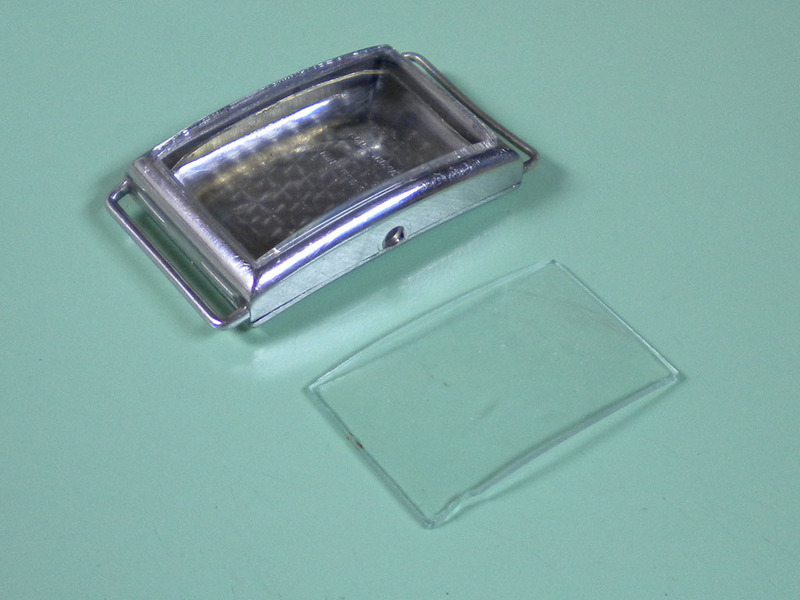 Meanwhile the glass was removed and measured and the solder removed from the side of the case. The curved glass wasn’t available in the size we needed so I had to buy an oversize blank with the correct curvature and trim it down to fit. 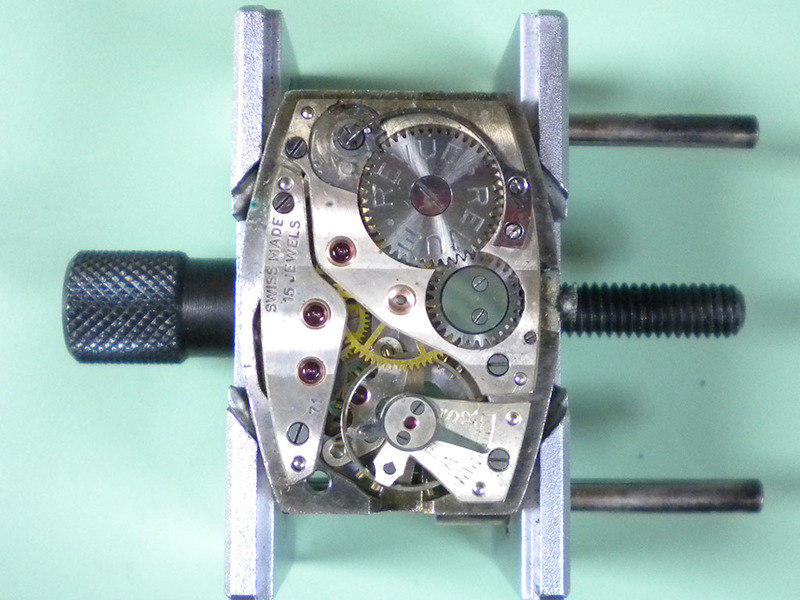 The movement going back together, it was decided to keep the click spring modification as it was part of the watches history. 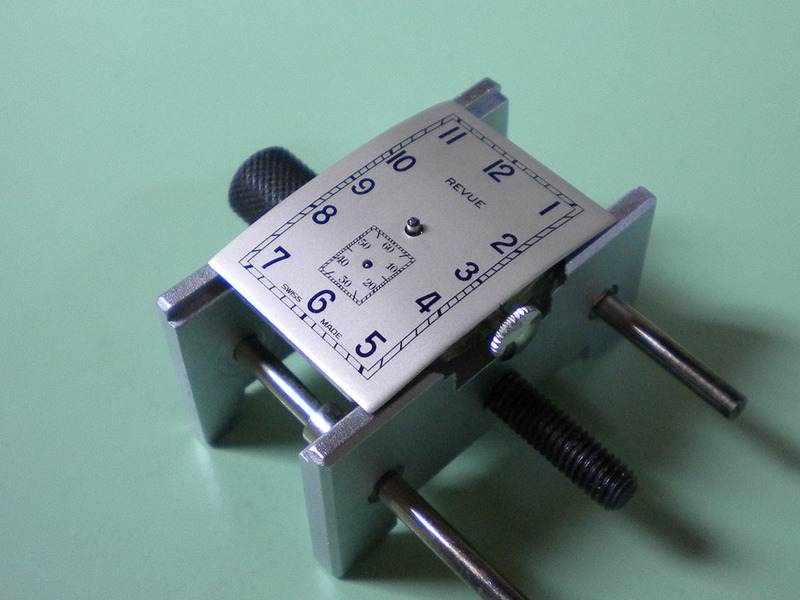 The dial arrived back from the refinishers and was fitted. The hands were then refitted and the movement recased. 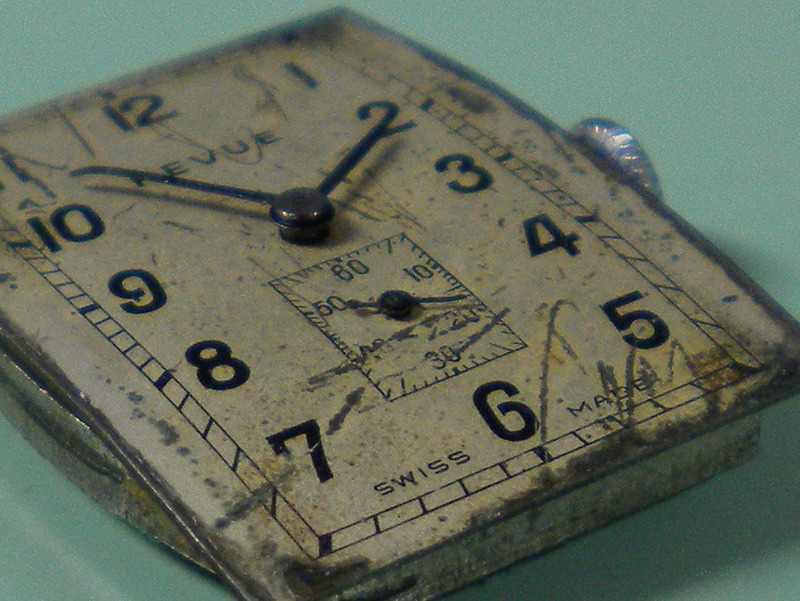 The watch was put on test to see how it performed and fine tune the regulation if needed. 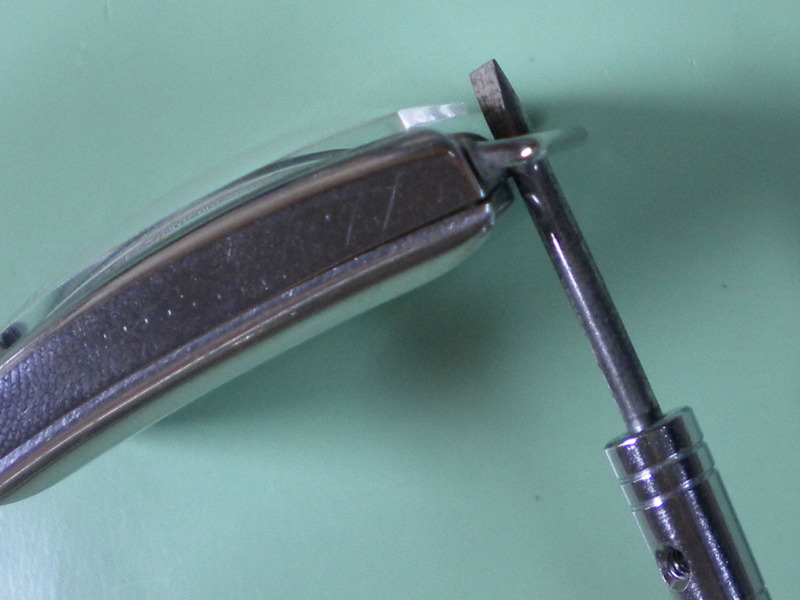 When it was taken off the tester for the final time the shoddy lug repair surfaced again, just the tension of the strap holding the watch to the machine was enough to make the lug let go. 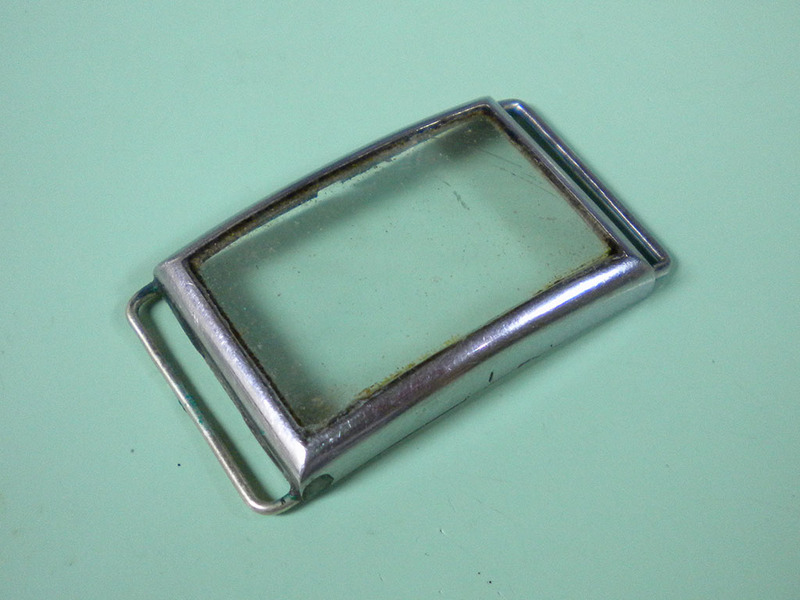 The case had to be stripped once again and the lug was properly soldered back on. 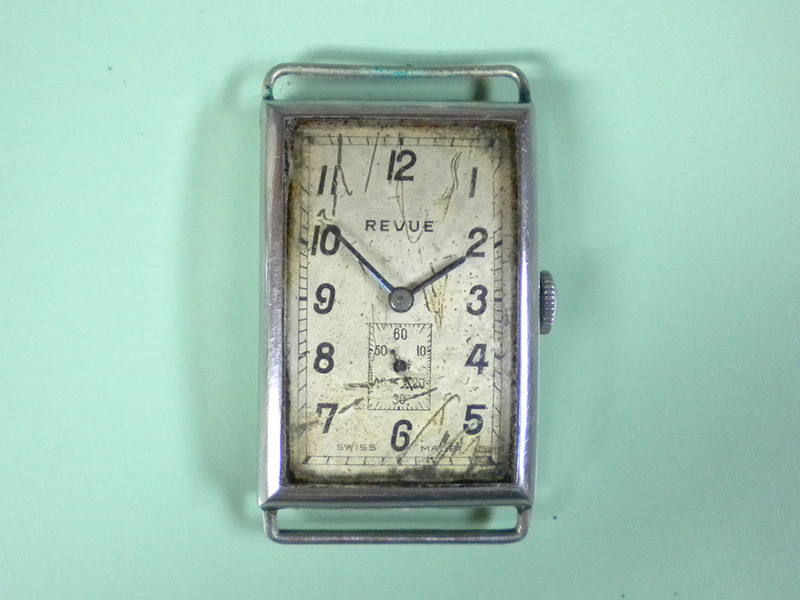 That meant it was now finished, a charming watch that’s hopefully good for the owner for the next 70 years or so.